Choose the menu item "Documents." 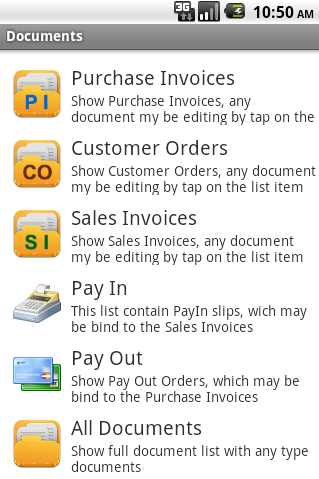 In the opened window select "Sales Invoice". 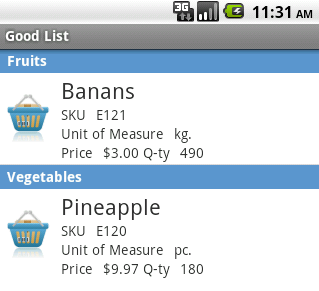 Button on the phone "Menu", open the options menu. Click "New Document". Opens a new Sales Invoice. Document number and date is inserted automatically. If necessary, you can change them. The document number is changed manually. To change the date you need to click with the date window will open for editing dates. 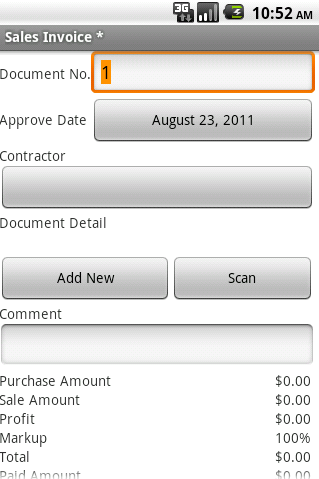 To select a contractor click the button below labeled "Contractor." 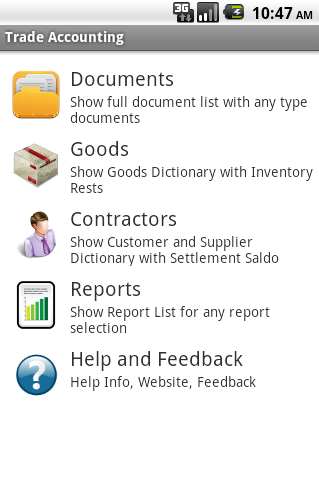 Open contractors Dictionary. 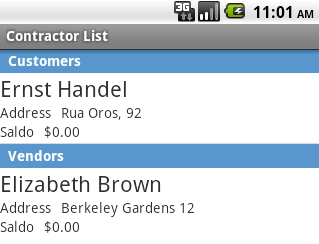 If necessary contractor in the directory is missing, create it by clicking the "New Contractor" in the options menu. 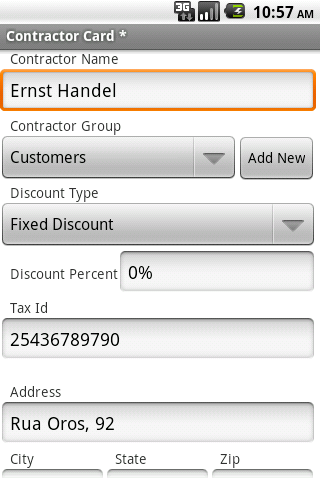 If necessary, add a new group of contractors on the button "Add New". Now, to save the data press the phone button "Back". You will see a message about saving data. Click "Yes" and leave the card contractor. The data are stored. 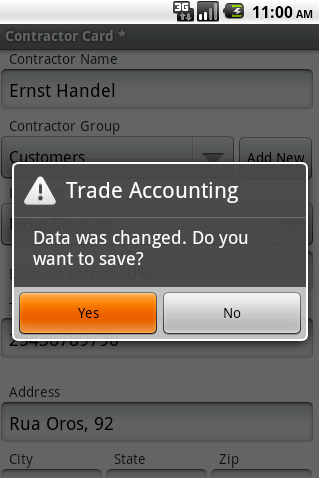 If you click "No", then exit the form without saving your changes. The third option - click the phone button "Back" and return to form for further editing. This principle of preservation of data for all editors in our application. After saving the new contractor will appear in the Contractor Dictionary. Click on it so that it appears in our Sales Invoice. Now, to add items to an invoice, click on "Add New". Open dictionary goods. 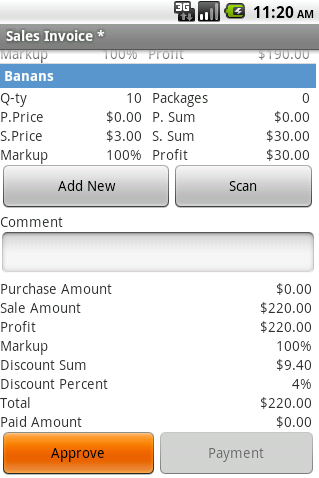 Click on the item you want to add in the consignment, which opens the editor of the parties to the sale. 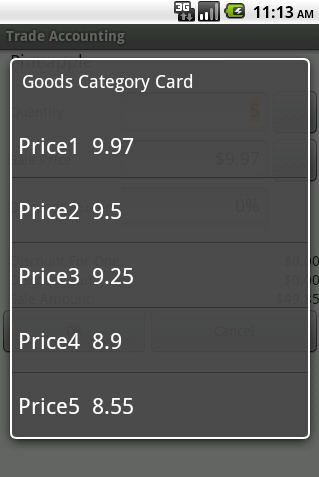 Here, you enter the number of shipped goods, the retail price of the goods. By default, the editor of parties on the sale Price1 listed a directory. If necessary, you can install any of the reference price by clicking on the "..." button next to the field with a sale price. Will open a list reference prices. 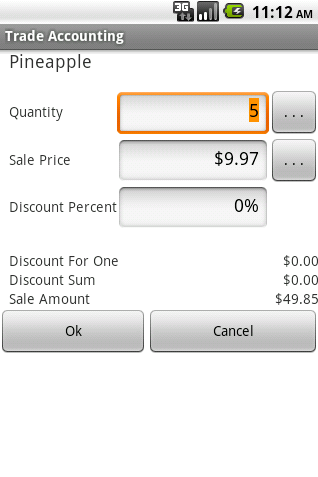 One click, select the necessary price to us. 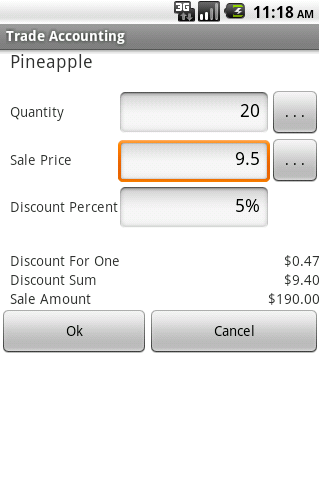 If you change the retail price is automatically calculated by the percentage discount provided by the buyer. 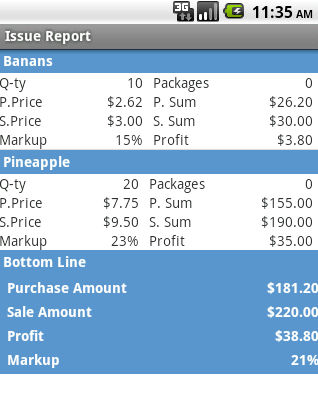 You can also see the totals for this sale of the Party: the discount for a unit and the total amount of discount for the party in the currency, the amount of sales. 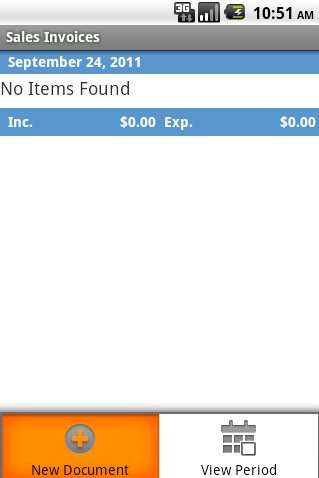 Click "OK", and product entry will appear in the expenditure invoice. Similarly, add the invoice other products. Created document can be in two states: suspended and approved. 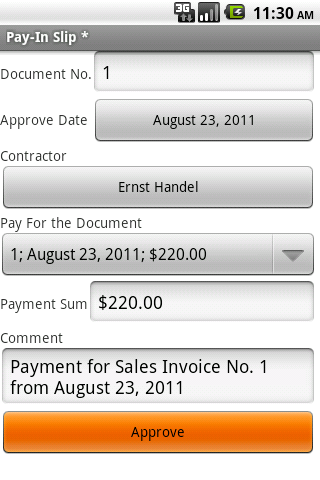 If you just leave the invoice on the phone button "Back", the consignment is stored, and can return to editing it later. 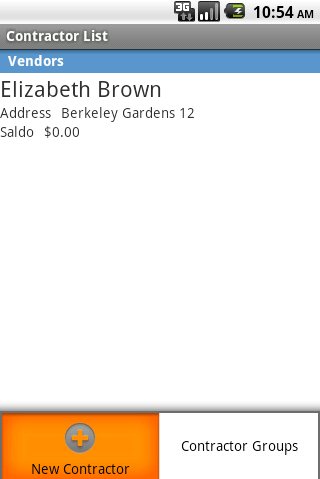 Note that the "Payment" button is not active, the document can not be deferred payment. Delayed bill preserves all the data entered, but does not make changes to your system (mutual settlement, trade balances). 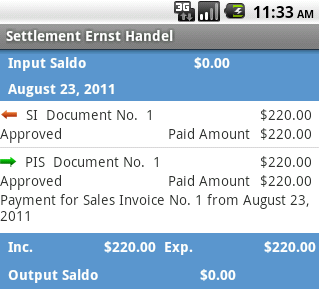 For the data invoice passed through the system, the invoice must be carried out. Click on the button "Approve". Now we make our payment the expenditure bill. Click "Payment" after approval it becomes active. Open cash register receipt the order. 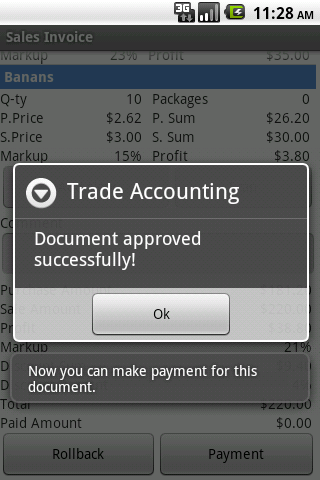 At this point, the shipment of the goods and making payment for it is completed. Now let's see what changes have occurred in the accounting system. The handbook of goods trade remains unchanged. In the directory contractors clicking while holding open the context menu and look at a card party to a settlements. If the bill is not paid in full, you can see the change in the balance of the counterparty. 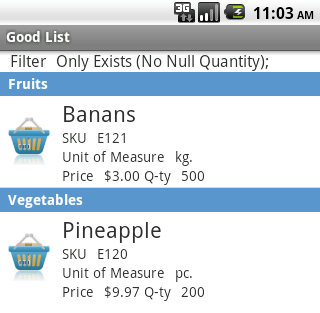 The Issue Report expenditure on shipments for each product individually. 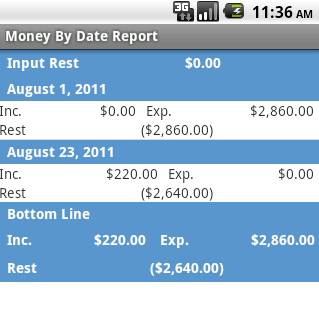 The report "Money By Date Report" You can see the movement of money in our accounting system.